The Dog Homefront: The Perfect Accessories for A Dog Lover’s Home. Day trips are perks in our line of work. We meet new dogs and enjoy listening to humans tell their favorite dog stories. Talking about dogs instantly puts a smile on everyone’s face and the room at ease. Here are some of our favorite stops over the last couple of weeks. We recently met Charlie at Waterside Furnishings in Dunedin where “Dogs Are Allowed But Husbands Must Be On A Leash.” Charlie was born in Scotland and moved to Dunedin with his humans a couple of years ago. 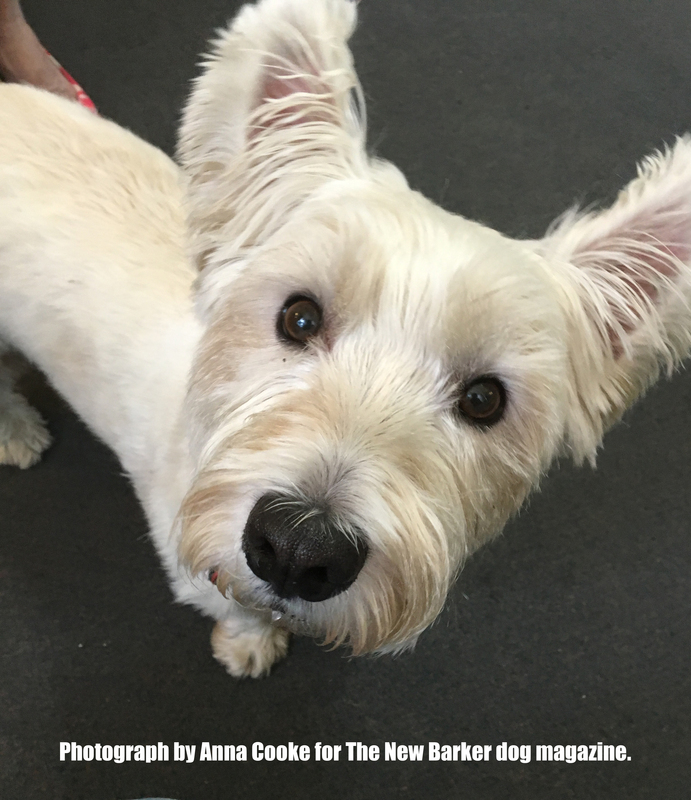 He has the sweetest face and the biggest Westie ears we’ve ever seen. Charlie, the West Highland Terrier. Our House a very fine house on Main Street in Dunedin has some beautiful treasures for the dog lover’s home and garden. 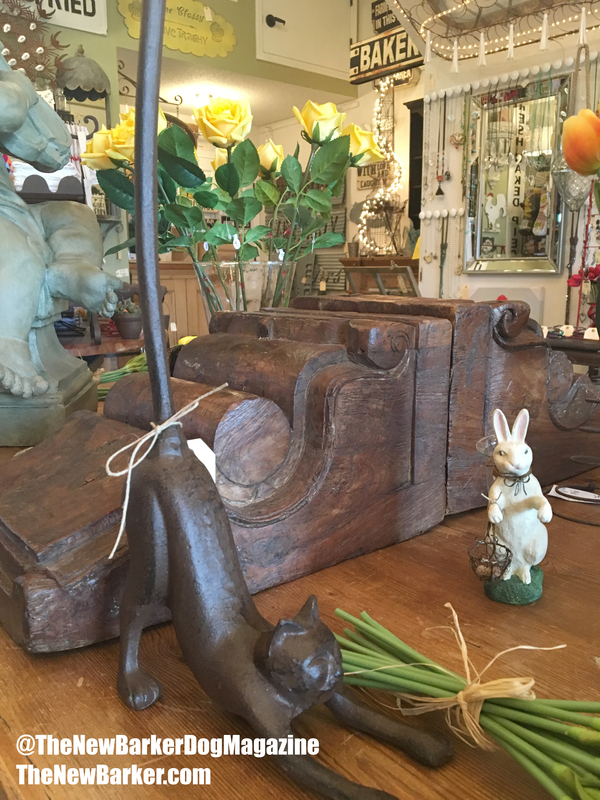 Proprietor and fellow dog lover René Johnson has a special creative touch for retail. We fell in love with the outdoor accent sculptures, like this one. 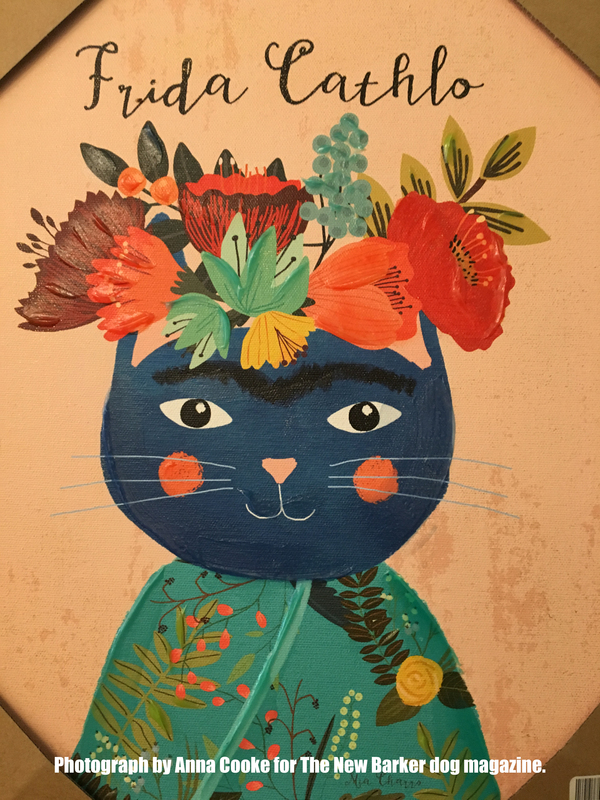 Cat Lovers, check out the Frida Cathlo art. 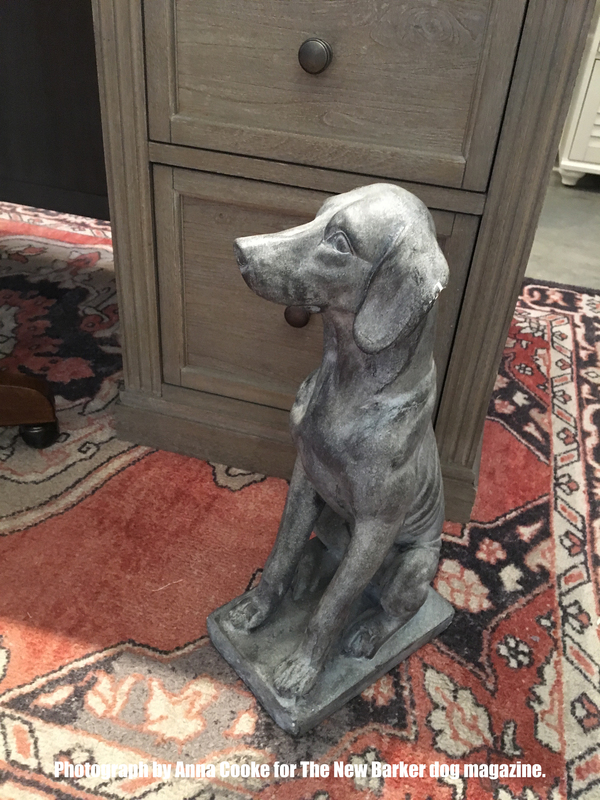 A variety of artisan dog sculptures for outdoor living rooms. Cat lovers, you’ll find some surprises as well. Pottery Barn Old Hyde Park is having a Summer Sale and look what we found. 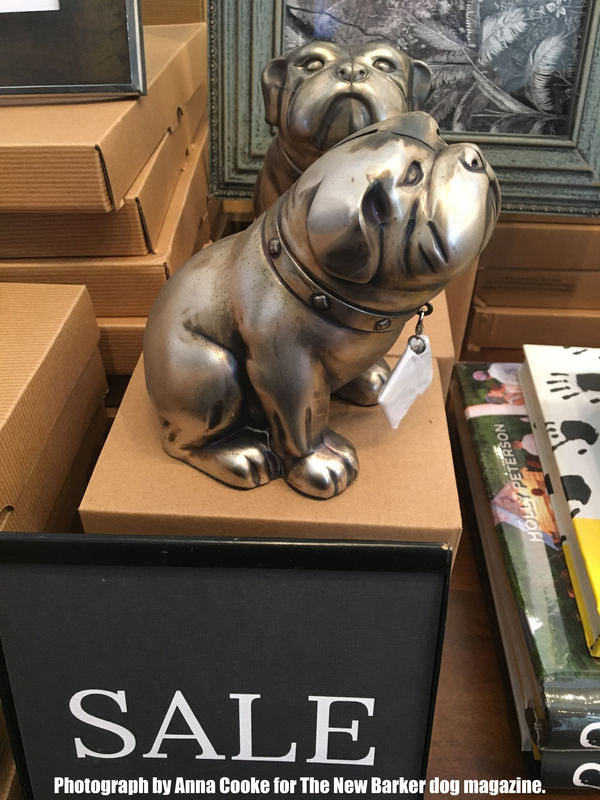 Bulldog Bookends and a dog statue. We’ve been traveling to and from Dade City for years, and enjoy our shopping visits at the always-evolving Dog Mania & Cats. On a recent visit, instead of heading straight out of town, we made a left at the light towards San Antonio. An old red brick building caught our eye, as did the sign of one of the businesses: Tangerine Hill – Red Dog Designer Home. The shop’s proprietor, Rose, is a dog lover and full of colorful stories, so naturally, her store has some surprising dog-themed finds. Afterwards, she insisted we visit with Uncle Johnny, next door, at San Antonio Antiques for some more surprises. 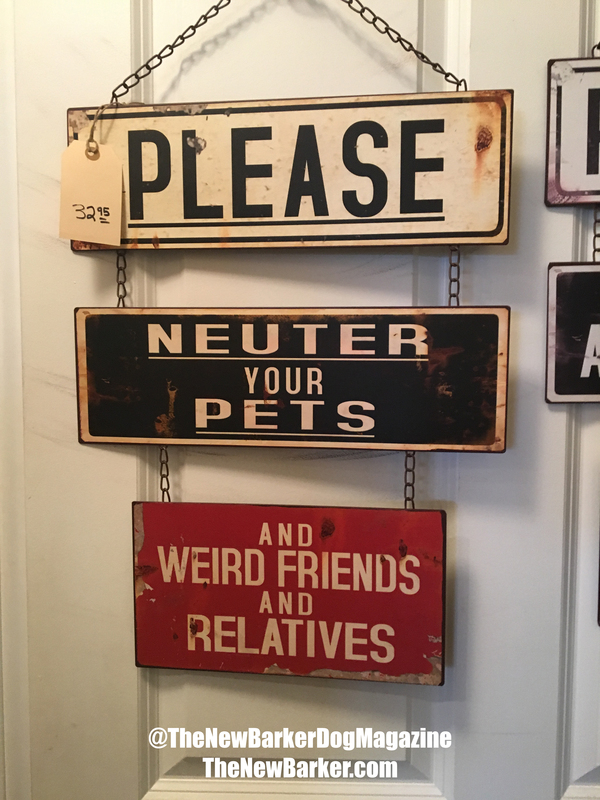 Fun signs and yard art at Tangerine Hill – Red Dog Designer Home. Paper Towel Holder for Cat Lovers. 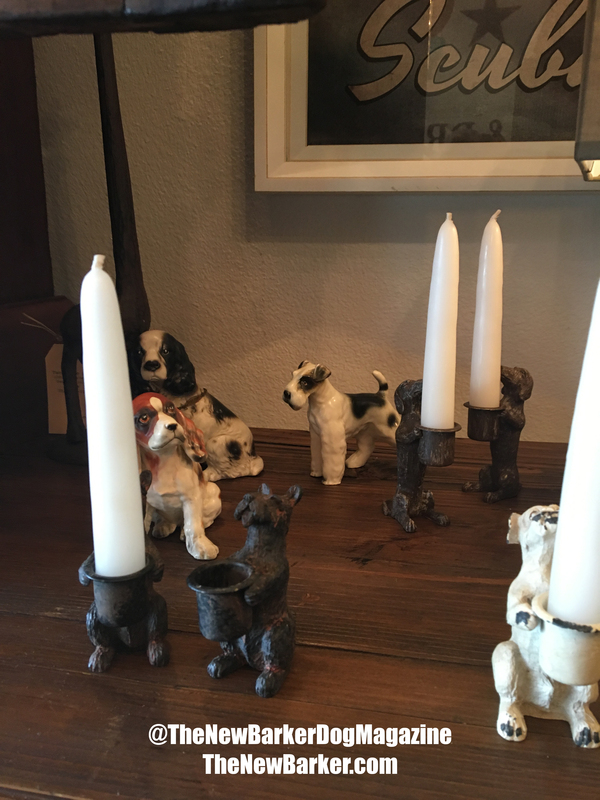 Porcelain dog figurines and cast iron dog candle holders. 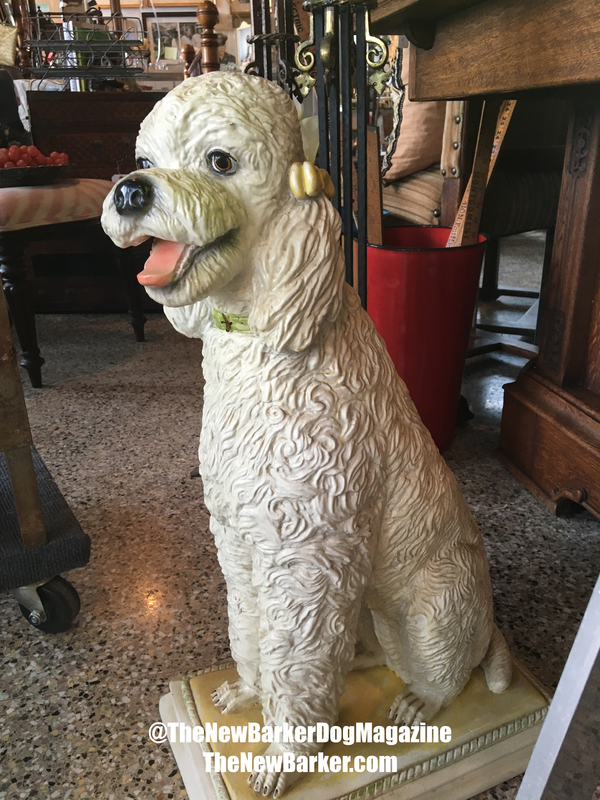 Life size Standard Poodle glass statue at San Antonio Antiques. 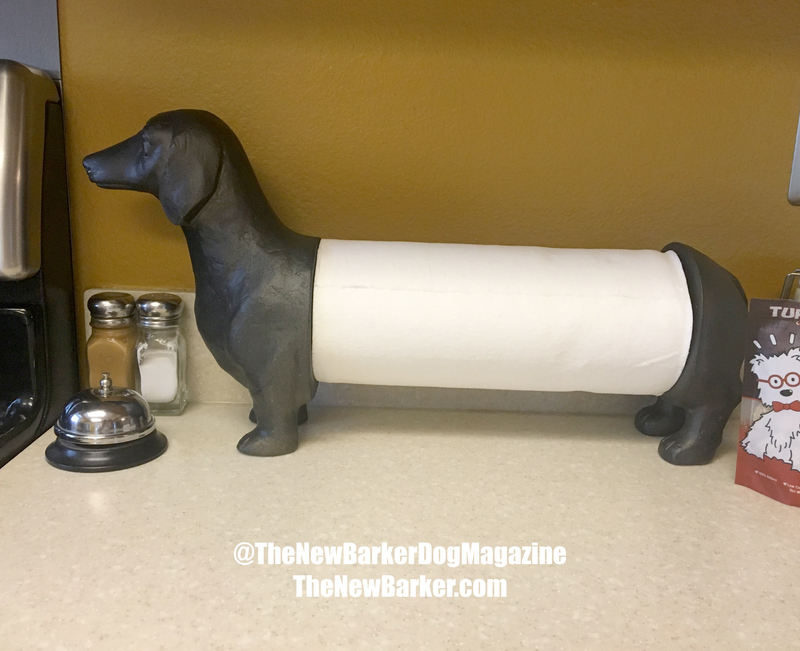 Our new Wiener Paper Towel Holder from Tangerine Hill. Perfect! Waiting (not patiently) for the newest edition of The New Barker dog magazine to come off the presses, it seemed like a good idea to attend a couple of dog events. Listening to what other people are dealing with, especially in the world of animal advocacy and dog rescue, puts things back into proper perspective. First stop of the day: Heritage Park in Land O’Lakes, Florida for Woofstock, an event co-hosted by Friends of Animal Services. Koda’s Story (above), as told by his humans: As a puppy, he was left outside with his litter mates to fend for themselves. “Our dad found him on the side of a busy road. He was the only puppy alive. The others died while trying to get across the road,” said one of the two sisters with Koda. They nursed the pup, a Lhasa Apso mix, back to health. “And, 13 years later, here he is,” they said. K9 Knox and Deputy Wilkins (above): Tracking is tough, as evidenced by the swamp track work done last month by K9 Knox and Deputy Wilkins. A vehicle, traveling southbound on US 41 at a high rate of speed, was the subject of a case in Hernando County. When the vehicle slowed, the driver jumped out and fled on foot into a densely wooded, swampy area. Pasco Sheriff’s K9 Knox and Deputy Wilkins, along with Corporal Andrew Denbo, tracked the subject through the swamp and located the suspect, who was almost entirely submerged in mud. K9 Knox has been working on the department’s K9 team since November. “He’s an incredible tracker,” said Deputy Wilkins. “So, tracking with him is really fun.” At home, Knox is the family pet, receiving lots of love and attention from everyone. “But, as soon as his harness goes on, he knows he’s going to work. And he’s ready,” said Deputy Wilkins. Here is a link to a video of K9 Knox during some down time Deputy Wilkins. We love the hop, hop, hop…and that tongue! Partner Rescue Groups: The rescue groups are vital to any shelter, as they help to reduce crowding, by pulling dogs. We said hello to the volunteers at several of the rescue groups participating at Woofstock: Florida Cocker Spaniel Rescue, English Springer Spaniel Rescue Southeast and Skyway Dachshund Rescue, who had the most adoptables on-site, with one wanna-be Doxie, Ms. Scarlett. Volunteer Stephanie was picking up a Dachshund at Hillsborough County Animal Services (HCAS) when she saw a very pregnant black dog named Scarlett. She was also heart worm positive. “We rescue Doxies, but I’ll take pregnant dogs and any dogs in a desperate situation, if I’m able to,” said Stephanie. So, Scarlett went home with her. Only one of the two puppies Scarlett delivered lived, and eventually adopted. Then, HCAS helped with Scarlett’s heart worm treatment and she’s now ready for her forever home. She is a very sweet, well-mannered dog, greeting people, who came to the booth, with a wide grin and a happy tail. Sweet Reese (above): She is also available for adoption through Skyway Dachshund Rescue. The group pulled her from Pasco County Animal Service when she was also very pregnant. All of Reese’s puppies were healthy and have since been adopted. Now, it’s Reese’s turn to find her forever home. Before leaving the event, we met with Abby Cox, president of Friends of Animal Services; Michael Shumate, director of Pasco County Animal Services and Spencer Conover, the newly-hired Assistant Director of Animal Services at the shelter. They’re excited to be participants, once again, during this year’s Just One Day event on June 11 with The New Barker and Morgan Auto Group. We’re doing something a little different. Stay tuned for the announcement, this week. Our next stop: Asturia for Dog Day Afternoon: Co-hosted by David Weekley Homes with proceeds benefiting Vets4Pets Charitable Clinic. Residents came out to support and learn more about what the clinic is doing. Travis and Buddy the Beagle take a break with their human during Dog Day Afternoon at Asturia in Odessa. The Tampa non-profit is providing medical care and food for the pets of those citizens on limited income. This is not a service provided to people who want to pay less for veterinary care. This is a service for those who have little to no means of treating their pets. Karma at Vets4Pets Charitable Clinic, brought in with his human by MPO Bart Wester of the Tampa Police Department. Suds On Sunday, a benefit for Vets4Pets, will be on June 3rd at Ferg’s Live Tampa. The fundraising event, co-hosted by Tito’s Handmade Vodka and The New Barker, will be for Tampa Bay area first responders, in honor of Karma and MPO Wester. We’ll see you there. Chloe, a happy dog, with her human during Woofstock for Pasco County Animal Services. A Beautiful Dog, Each & Every One. 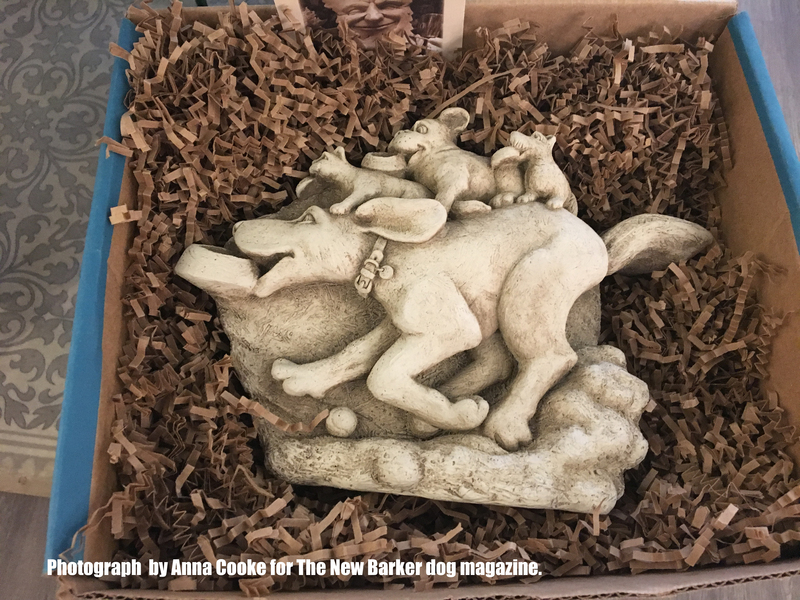 After the winter 2017/18 edition of The New Barker was released in December, Aimee Sadler, founder of Dogs Playing For Life, gave us a call. We had interviewed her as part of our feature story on the Ontario 21, the dogs confiscated in a dog fighting ring in Ontario. (click here to see digital article on page 30). #SaveThe21 campaign supporters from around the world included actress Maggie Q, Sir Richard Branson and our own Angel. The dogs, Aimee told me, were ready to be adopted. She asked if we would like to meet and help photograph them as part of their adoption process. Within days, arrangements were confirmed, and I was heading to Wellborn, Florida for the assignment. Later that day, I would continue my travels to Tallahassee to attend Humane Lobby Day, which was the following day. It was a life-changing 48 hours. Here is my album of the Ontario 21. What a transformation, thanks to Dogs Playing for Life. Special thanks to all of those who rallied for their lives, around the world, including Rob Scheinberg, co-founder of Dog Tales Rescue and Sanctuary in Ontario. In 2014, Orange County Animal Services in Florida took all breed information off their kennels. Not only did adoptions of dogs that would have been labeled pit bulls go up, but adoptions for all breeds improved. This reprinted article (from June 2017) is part of Future Tense, a partnership between Slate, New America, and Arizona State University. Boris and Brendan could be twins. Both are on the short side, with brown hair and small gleaming eyes set into broad heads. Both wagged their tails excitedly when someone came to their kennel and yapped sadly when that person walked away. Yet the fates of these two dogs, both up for adoption at an open-admission shelter in Florida, were very different. Boris found a new home in just a week. Brendan stayed two months before someone took him in. He would almost certainly have been euthanized—as nearly a million dogs are each year in the United States—had the shelter not adopted a “no-kill” policy shortly before his arrival. So what was it about Boris and Brendan that led to such different outcomes? At the shelter, Boris (left) was labeled a Labrador/German short-haired pointer cross. Brendan (right) was labeled a pit bull. The distinctions between dog breeds might sound as solid as car marques and model numbers, but the latest behavioral research indicates they don’t tell us much that’s useful about dogs. With man’s best friend, just as for his master and mistress, stereotypes based on perceived heritage are often misguided or just plain wrong. For one thing, “pit bull” isn’t even a recognized breed—it’s just a grab bag of small, squat, wide-faced canines that got a bad reputation in the 1980s when they became the young male urban underclass’s preferred projection of strength. A study that thoroughly investigated all fatal dog attacks in the United States over the 2000s showed that many other factors were more important than breed in determining when things went bad. Factors such as whether the dog was male or female, sterilized or not, and evidence dogs had been abused or neglected all played a bigger role than the dog’s (often inaccurately reported) breed identity. For another, character, in dogs as in people, is a complex mix of genetic and environmental influences. Just as jumping to conclusions about people because of their ethnic background has many negative consequences for all concerned, breed stereotypes have led to pit bulls being overrepresented in many American animal shelters. In fact, some shelters won’t even put a dog up for adoption if it is believed to be a pit bull. People looking for new canine companions often ask, “What kind of dog is that?” This question makes shelters feel compelled to answer with the name of a breed—even when the vast majority of their dogs don’t come with papers or printouts from genetic testing. The breed labels that potential adopters see on the cards hanging on a dog’s kennel, and on which so much of a dog’s fate depends, are just guesses based on the dog’s appearance. Since there are more than 200 known breeds, which can be combined in up to 55 trillion different ways, we shouldn’t be surprised that these guesses are usually wrong. Shelter dogs have far more complex breed heritages than we could have ever imagined. Arizona State University Canine Science Collaboratory tested the reliability of shelters’ breed assignments using DNA analysis to uncover the heritage of nearly 1,000 dogs at two shelters in the western United States. Of the dogs tested, only 12 percent were purebreds or a straight mix of two breeds. Small wonder, then, that staff only correctly identified all the breeds in a dog’s makeup in just a 10th of their animals. Most of those were the handful of purebreds in their care. Presumably people ask for breed information because they think it will tell them something about the character of the dog they plan to adopt. However, the evidence for personality differences between breeds of dogs is surprisingly weak. Two studies, each involving over 13,000 dogs, found that the personality differences within each breed were as large or even larger than the character differences between breeds. And the available data don’t back up long-held expectations of the behavior of different dog breeds. English springer spaniels, for example, which the American Kennel Club describes as “friendly” and “eager to please” consistently show up in studies as at an elevated risk of owner-directed aggression. And if the dog isn’t a purebred, all bets are off. Mixing genes isn’t like mixing paints. A dash of border collie with a helping of Labrador doesn’t automatically produce a dog that likes to swim and herd sheep. Yet despite all that is misguided about jumping to conclusions based on (usually inaccurate) breed identification, we found that these labels influence people more strongly than the behavior of the dog in front of them. It’s not just Boris and Brendan. We set up a study in which we showed 51 people visiting a shelter brief videos of dogs reacting to a stranger walking up to their kennels. One set of recordings showed dogs that the shelter had designated as pit bulls. The other showed dogs we thought looked very similar that had been given other breed designations by shelter staff. We called these dogs “look-alikes.” All our participants had to do was sit at a computer and watch the videos one after the other, answering a range of questions to gauge their interest in adopting each dog. When we hid the breed labels from viewers, people actually told us they thought the dogs that had been originally identified as pit bulls were more attractive than the look-alikes. However, if we put the labels back on, the pit bulls’ popularity plummeted. This backs up the findings from a study carried out by researchers at the University of Louisville. They tracked nearly 10,000 dogs entering a large municipal shelter in Kentucky over a two-year period and found that fully three-quarters of all pit bulls were euthanized. So how do we prevent these unhelpful biases from affecting the dogs that don’t deserve them? In 2014, Orange County Animal Services in Florida tried a brave experiment. It took all breed information off their kennels. Not only did adoptions of dogs that would have been labeled pit bulls go up a massive 75 percent, but adoptions for all breeds improved. Overall, the county found homes for 30 percent more of their dogs. This isn’t a little bijou shelter either—it’s a major animal control operation that takes in every unwanted animal in the greater Orlando area, to the tune of 8,000 dogs per year. And it’s sustained that improvement in adoption rates for over two years now. Orange County offers a model for other shelters for getting rid of unhelpful identifiers. Just like their owners, most shelter dogs are rich mixtures of genetic influences, and just like us, their personalities are not dictated by the race of their ancestors. So it makes more sense to treat finding a canine life partner more like finding a human companion. See past labels and seek real compatibility, go out on a couple of dates, try a weekend sleepover. Let’s not fret over finding “golden retrievers” or “pit bulls.” Let’s talk about “beer buddies,” “fitness fanatics,” and “canines to curl up on the couch with.” Dogs that fit these job descriptions can be found in just about any breed or mix. Behavioral science cannot solve pet overpopulation or save every mutt that ends up at a shelter, but we believe it can guide people toward smarter choices. Like the members of the species that cares for them, dogs deserve to be known as individuals. Get out to your local shelter, see past the labels, and start a beautiful friendship. Clive D. L. Wynne is director of the Canine Science Collaboratory at Arizona State University, where he is also a professor of psychology. Lisa M. Gunter is a Ph.D. candidate at Arizona State University in the department of psychology and conducts her research under the mentoring of Clive Wynne.